This entry was posted on Tuesday, May 27th, 2008 at 11:30 pm	and is filed under Main Dishes, McCormick & Schmick. You can follow any responses to this entry through the RSS 2.0 feed. You can leave a response, or trackback from your own site. Yeah, we put minced jalapeños in the one we use for the fish tacos… this recipe actually called for Ono, but I wasn’t able to pick any up over the weekend. Delicious! I love the flavor combinations! 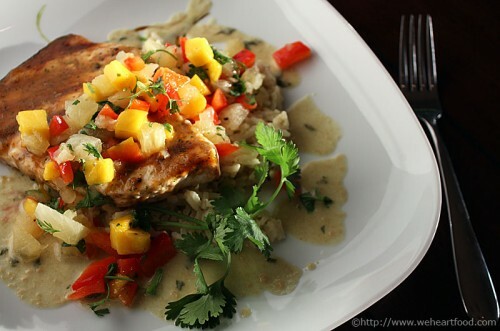 You can never go wrong with mango salsa!